After pursuing higher education in metropolises across the country, many Ladakhi youngsters are returning to rediscover their culture and history in a new light. How? Through indigenous textiles and weaves. Every bend and turn in this town is a photographer’s dream. It’s like walking out of bed and nose-diving into a picture postcard. Half the year is spent under a lockdown of snow and ice, completely washed out by a blanket of white. But, when it’s thawed out during the remaining six months, the phenomenon of FOMO (fear of missing out) is real in the land of high passes. With no universities and only a handful of colleges offering limited courses in their hometown, an outflux of young energy has been the norm in Ladakh. However, the winds are changing: after pursuing higher education in metropolises across the country, many Ladakhi youngsters are returning to rediscover their culture and history in a new light. How? Through indigenous textiles and weaves. “The number of government jobs in Ladakh has reduced in the past couple of years, forcing youngsters to think creatively for their livelihood,” says Tashi Morup, projects director at the Ladakh Arts and Media Organisation. And while many are investing in local food and drinks, a considerable number are showing interest in traditional garments and weaves. Designer Stanzin Palmo weaves colours on the usually plain pashmina. 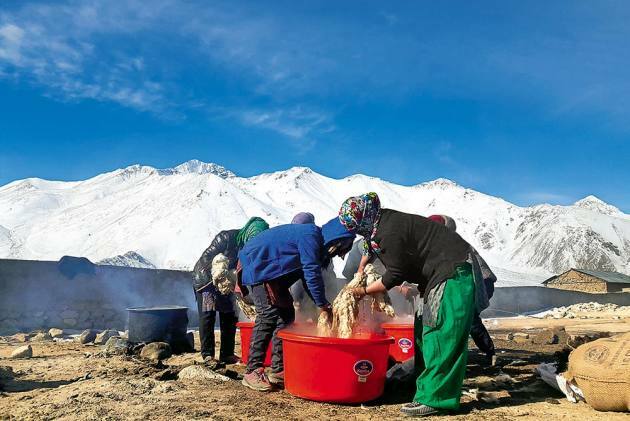 In an initiative to create sustainable employment for nomads, Project Laksal was established in 2017 under the leadership of former deputy commissioner of Leh G. Prasanna Ramaswamy. Laksal, which means ‘skill’ in the local tongue, provided a training and development platform for women from eight villages in Ladakh, forming a cooperative that would go on to spearhead the brand ‘Looms of Ladakh’. “Pashmina is a Rs 200-crore business, of which only 15 crore went to Ladakh. So the idea behind Looms of Ladakh was to empower the women and have them take over the cooperative. There are six elected members who are all from Ladakh, and within the first year, they’ve been to Delhi’s Dastkar—and now they’ll be going to London,” says Ramaswamy’s wife, Abhilasha Bahuguna, who also oversees project strategy and brand development at Laksal. As winter approaches, preparations for upcoming collections are in full swing in the design studios dotting the hills. Ladakh’s youth have followed the lead of Utpala, established in 2004, in spinning gold out of the snow burying their homes. With chimneys smoking and the hearth burning, Utpala founder Phuntsog Angmo ensured that the spindles kept rolling even during winters to clothe the world in warm Ladakhi weaves for the rest of the year. “I studied economics at Delhi University. Honestly, I wasn’t interested in what my mother was doing with her business initially,” says 27-year-old Stanzin Zasal, Angmo’s son, who’s overseeing operations at Utpala. But soon enough, the fascinating hues of pashmina and silk caught Zasal’s attention, and drew him into the family business. Sonam Angmo and Stanzin Minglek’s (above) Lena Ladakh is known for hand-dyeing pashmina. It’s only in the past couple of decades that the doors to this bigger world have been thrown open to the people of the mountains, spearheaded by the success story of Jigmat Couture, a home-grown label that’s been draped by Bollywood A-listers. The husband-wife duo, who started their luxury shop in 2010, set a steep benchmark by earning a global following. Nearly a decade since, founder Jigmat believes the rules of business remain unc­hanged. “You have to have your own philosophy and your own identity. Don’t copy. You can’t compete with the artistes of Kashmir, so if you put the embroidery work of another state on your shawl, it doesn’t preserve your native identity,” he says. For the founders of two-year-old brand Lena Ladakh, Sonam Angmo and Stanzin Minglek, their venture is still a work in progress. While operating mostly through online platforms like Instagram, they are building up to open their first flagship store in Leh market. Specialising in hand-dyeing their ‘lena’ (pashmina in Ladakhi), the enterprise has caught the fancy of many textile and fashion enthusiasts. “We ship even internationally now. An entire shawl takes around 15–20 days to make, so it’s a slow art. We use plants and herbs for our dyes, like indigo, marigold, walnut, Himalayan rhubarb, arnebia,” Angmo says. A host of bright colours adorns the weave spun at Lena Ladakh, digressing refreshingly from the plains and checks traditionally seen on pashmina clothing. Weaving is no longer the exclusive domain of the grand old amalays, or mothers, of Ladakh. “Even college-going girls have started to do it part-time,” Sonam Angmo says. And why not? “There’s a lot of scope, you just need an imagination,” says Monisha Ahmed, executive director, Ladakh Arts and Media Organisation, and author of Pashmina: The Kashmir Shawl and Beyond. For Ahmed, it’s exciting to see young Ladakhis take an interest in their heritage and create original art instead of “turning and comparing to Kashmir”. However, it’s just as “imp­ortant to look at other variants of wool and not only pashmina, so as to avoid creating an imbalance in the livestock population,” she points out. The local textile and fashion community is making a concerted effort to secure a GI, or geographical indication tag, for the Ladakhi pashmina, to put a stamp on what “belongs to Ladakh”, as Stanzin Palmo puts it. However, with or without a seal, the Ladakhi spindles have only begun to gather heat to weave their magic on a cold, colourless world. Ex-PM Deve Gowda is burning the trail in new seat Tumkur.